When I told you before that I recommended reading Sheepish by Catherine Friend, it was because I think it’s a laugh-out-loud memoir about life on a sheep farm. But that wasn’t all that I liked about it. I also liked the information it provided about sheep and wool. Among other things, I learned that I’m probably not allergic to wool. When you tell the average person to picture themselves wearing a wool sweater, there’s a good chance that the image that comes to mind is one of a stuffy childhood nightmare pulling at a non-stop itchy collar on one of those ugly holiday sweaters. Many people have had this experience or another bad experience with an itchy wool sweater and they mistakenly believe that it was itchy because they have an allergy to wool. What I learned from Friend’s book, Sheepish, is that this is unlikely. “A wool fiber is made of up overlapping scales. Imagine clay pots stacked inside each other, and you’ll have the structure of a strand of wool. Some of us with sensitive skin can feel the sharp edges of those “pots”, or scales”. “A strand of wool is measured in microns – the lower the number, the finer the strand – and microns range from seventeen up to forty. The finer the strand, the less likely we are to feel those edges, because they are so small. That’s why baby blankets and soft-drapey sweaters are made from the wool of Merino sheep, or from alpacas, because that fleece has a lower micron count”. So, are you allergic to wool? Possibly. But there’s a good chance that the itchiness you feel from wool is just the scales of the wool fiber and if you use a finer type of wool then you won’t feel that itch. Colored sheep wool takes dye far differently than pure white sheep wool. Wool is crazy durable. Friend reports on research that sows “wool fibers can be bent back on themselves more than twenty thousands times without breaking” in contrast to cotton which breaks after less than four thousands bends. There are 220 yards of wool in one baseball. And it’s that wool that gives the baseball its bounce. Who knew?! Wool has been used to clean up oil spills, insulate houses, pad ballet toe shoes and keep military members warm but safe because of the fiber’s natural fire-retardant properties. Those are just a few of the ways wool can be used other than to make a great crochet or knit sweater! 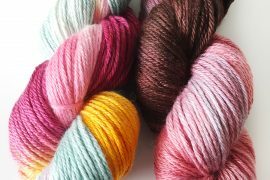 What’s your favorite wool yarn to work with? 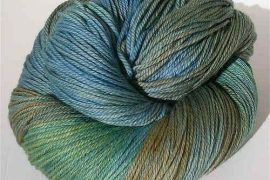 What is Superwash Merino Wool? 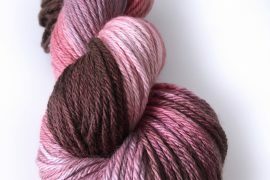 Koigu KPPPM has stolen my heart this fall. I found it for sale on Knitting Paradise, a yarn forum to wich I belong, and bought two hanks. Well, Sunshine, I have never looked back. I have bought it four more times, crocheted it until there was none left and then bought Superwash merino which is Very Close to the best everc uz it’s washable. I love the colors of Koigu and the feel of it against my skin. I have designed a neckerchief (Cowly Scarf I call it) pattern that uses simple crochet and shows off the palette to its best angle. Totally in love with this yarn.